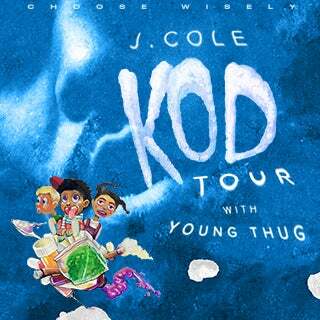 (Santa Monica, CA) — J. Cole has announced that he’ll embark on a 34-date tour in support of his chart-topping new album KOD, with special guest Young Thug. Produced by Live Nation, the tour will kick off in Miami on Aug. 9 and make stops across North America including Atlanta, Chicago, New York, Los Angeles and more, before wrapping in Boston on Oct. 10. See below for J. Cole’s full itinerary. Tickets for the Aug. 17 date at the AT&T Center in San Antonio are on sale now to the general public at Dreamville.com, Ticketmaster.com, ATTCenter.com and 800-745-3000.